Lorena Jones Books, 9780399578564, 336pp. The highly anticipated narrative-rich cookbook by Chicago’s superstar chef, Paul Kahan, whose destination restaurant, The Publican, is known for its incredibly delicious pork- and seafood-centric, beer-friendly cooking. PAUL KAHAN is executive chef and partner of The Publican and One Off Hospitality Group and has become the nationally recognized face of the Chicago food landscape. His businesses--Blackbird, Avec, The Publican (downtown and O'Hare locations), Publican Anker, Big Star, Publican Quality Meats, Nico Osteria, Dove's Luncheonette, and The Violet Hour--are consistently top-rated in Chicago and nationally. In addition to leading food media, Kahan has been covered in USA Today, the Wall Street Journal, Vogue, Travel + Leisure, The Atlantic, and the New Yorker, among others. Food & Wine named Kahan a Best New Chef and the James Beard Foundation has recognized him as Best Chef Midwest. COSMO GOSS trained at Gramercy Tavern and is The Publican's executive chef. In 2015, Goss was named to Forbes magazine's "30 Under 30" list. "Any page of the book reveals this food to be anything but simple and humble, no matter how many times Kahan and Goss assert that it is: The recipes are layered and multidimensional, they often ask the home cook to give half a dozen pans (or half a dozen days) to dinner. What this food has, instead of simplicity, is clarity: of flavor, philosophy, and intention, catapulted beyond the twee and precious by something that feels like recklessness but is actually just extraordinary skill. Whenever I’m at the Publican, I marvel to whomever I’m eating with that this is how I want to eat all the time. It turns out that’s possible, but it’s a lot harder than it looks. Maybe that’s the magic of it all." 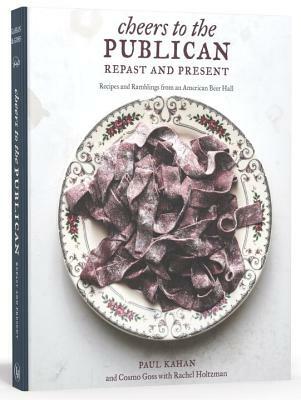 "This book—the first from the chefs behind one of Chicago's most treasured spots—is one giant toast to convivial American cuisine. It reads like a constitution, complete with an Anti-Tweezer Manifesto, containing mantras like "product maketh the dish," and recipes for the barbecue carrots and sour beer-steamed mussels that have amassed devout followers." "If you can't score a seat at Paul Kahan's white-hot Chicago beer hall, feast your eyes on his recipes for grilled sardines, braised pork shoulder, and more."